Our monthly artist studies culminate in a kids'-choice project to reflect the style of the master we have been studying. 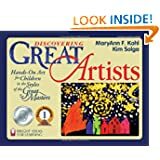 This is one of my favorite books for creative ideas inspired by the Masters. It covers artist from Giotto to the modern masters, from all over the world. There's a short bio for each artist and at least one project related to their style, subject matter, or technique. The book also has a chapter of games you can create to test your knowledge of art history. GREAT BOOK! 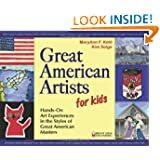 Similar to the above title, this one highlights 75 American artists from colonial times to the modern era. Have you done projects inspired by the great masters of art? Please tell us about it in Comments! yay! welcome to the CM carnival! thanks for sharing this!! i actually bought that book when we were in the US this last time, but i'm not sure where it is, packed in a box here, or in the US waiting for someone's suitcase to come down, or ?? anyway, your kids' work is super!